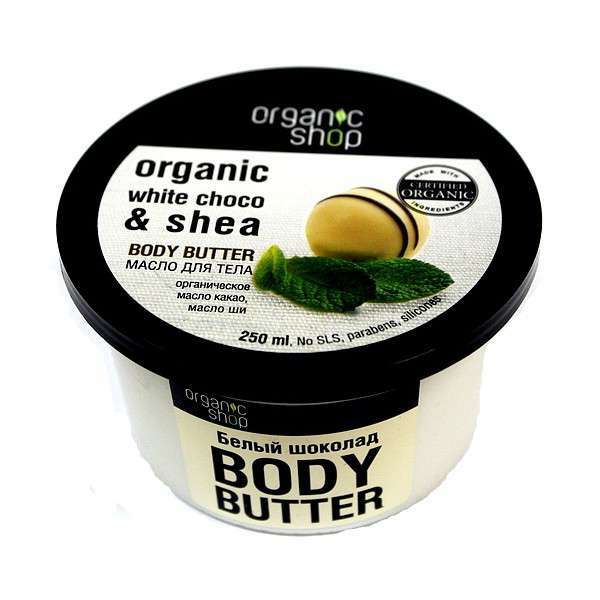 Organic White Choco & Shea Body Butter is produced by the Russian beauty brand Organic Shop. It is a delicious gift for your skin formulated with organic shea butter and organic cocoa butter. The wonderful scent of chocolate will transform your body care routine into a luxurious ritual. Organic shea (karite) butter contained in the product is a natural moisturiser. It is known for its anti-inflammatory and emollient properties. It also has a limited capacity to absorb UV radiation, acting as a sunscreen. Cocoa butter also has moisturising properties. Its velvety texture, pleasant fragrance and moisturising abilities have made it a popular cosmetic ingredient. It prevents stretch marks and dry, itchy skin. Directions. Apply to clean, dry skin with light, circular motions. Massage until absorbs. Ingredients. Aqua, Organic Butyrospermum Parkii, Organic Theobroma Cacao Seed Butter, Glyceryl Stearate, Glyceryl Alcohol, Glyceryl Glucoside, Sodium Stearoyl Gllutamate, Benzyl Alcohol, Benzoic Acid, Sorbic Acid, Parfum. Want to buy Organic White Choco & Shea Body Butter? Call us or submit your order via our web site! Natural and organic cosmetics produced by the Russian beauty brand Organic Shop are based on simple combinations of natural ingredients. They are free of potentially harmful chemical ingredients (parabens, SLS, synthetic fragrances, preservatives, colourants) and not tested on animals. All products by Organic Shop contain certified organic essential and vegetable oils as well as other natural ingredients fully approved for use in cosmetic products by leading European laboratories. Beauty products by Organic Shop comply with all the requirements that apply to modern cosmetics. They are natural and safe, highly effective and derived from environmentally friendly raw materials of plant origin. The brand offers a wide selection of skin, body and hair care products for all skin and hair types. You will surely find the products that are just right for you! Products by Organic Shop include, but are not limited to, shampoos, hair conditioners, face and hair masks, face and body scrubs, shower gels, bath foams, etc. Each product has a wonderful natural scent that transforms routine hair and skin care procedures into luxurious beauty rituals which you don’t want to end!